All around Steve Ayers’ yard there are hints of what some may consider an obsession with rainfall and irrigation. In flower beds and under oak trees, yellow cups made for measuring rain dot the landscape. An irrigation pressure reader hides in a front yard bush, and he even has a weather station positioned at the corner of his lanai roof. “I’m not the typical resident,” Ayers admits. As one of five ad hoc irrigation committee members for the Country Club Edgewater Village Association, Ayers is keen on solving some of the community’s irrigation-related issues. The Country Club Edgewater Village Association is the homeowners association for residents in the Lakewood Ranch Community Development Districts 2 and 5 portions of the Lakewood Ranch Golf and Country Club. With the support of Braden River Utilities, the ad hoc committee has seen improvements in using less irrigation water throughout the district. And with rainy season in full force, supervisors are considering what can be done to minimize water usage at a time when irrigation isn’t actually needed. Florida yards require about an inch of water per week — a requirement that’s been satisfied naturally since late May. Even so, in June, the districts used 47 million gallons of water, which cost the CDD $57,000. The water usage for CDDs 2 and 5 was 35 million gallons in June 2014, then fell to 25 million gallons in June 2015. However, it doubled to 50 million gallons in June 2016 followed by the 47 million gallons this past June. The CDDs control irrigation lines and distribution, while the HOA enforces watering restrictions. Options being discussed by the CDD include finding ways to encourage residents to turn off their systems during the rainy season, or a more drastic measure — turning off valves that supply irrigation water to district households during the rainy season. Turning off valves would require ample upfront communication with residents, blackout periods on plantings and other means by which the district could help ensure no property damage occurs due to lack of water. Lakewood Ranch Inter-District Authority Operations Director Paul Chetlain said his department uses the rainy season to install plant material, so such a change, while possible, would require careful planning and, in some instances, a delay in installing replacement plant materials. Members of the irrigation committee hope near zero-water usage during the rainy season will have a great impact. For example, if the HOA and CDDs can show the Southwest Florida Water Management District, the agency tasked with water conservation in the region, that they are serious about water conservation, the district may consider relaxing watering restrictions in the winter months, when more water is needed. Committee member Jack Kerber said even residents who balk at the idea of turning off their irrigation systems support it knowing it could result in increased dry-season watering. Ayers and irrigation committee members also hope the water district and Braden River Utilities will partner to sponsor a soil-moisture sensor program, like they did in mid-2013. At that time, residents could install a soil-moisture sensor device and be refunded for it through the program. The water district has expressed a reluctance to relaunch the program because only about 250 sensors were installed compared with the 400 available, Ayers said. All around Steve Ayers’ yard, there are hints of what some may consider an obsession with rainfall and irrigation. In flower beds and under oak trees, yellow cups made for measuring rain, dot the landscape. An irrigation pressure reader hides in a front-yard bush and he even has a weather station positioned at the corner of his lanai roof. As one of five ad hoc irrigation committee members for the Country Club Edgewater Village Association, Ayers is keen on solving some of the community's irrigation-related issues. The Country Club Edgewater Village Association is the homeowners association for residents in the Lakewood Ranch Community Development Districts 2 and 5 portions of the Lakewood Ranch Golf and Country Club. And with rainy season in full force, supervisors are considering what can be done to minimize water usage at a time when irrigation isn’t actually needed. 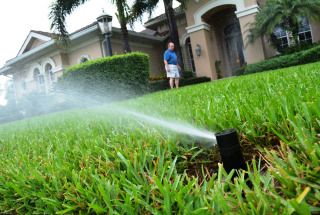 Florida yards require about one-inch of water per week — a requirement that’s been satisfied naturally since late May. Ayers said the monthly average for water usage between CDDs 2 and 5 continues to grow, exceeding 110 million gallons in June, compared with about 70 million gallons in June 2015 and less than 40 million gallons in June 2014. Options being discussed by the CDD include finding ways to encourage residents to turn their systems off during the rainy season, or a more drastic measure — turning off valves that supply irrigation water to district households during the rainy season. Committee member Jack Kerber said even residents who balk at the idea of turning off their irrigation systems, support it knowing it could result in increased dry-season watering. Ayers and irrigation committee members also hope the Water Management District and Braden River Utilities will partner to sponsor a soil-moisture sensor program, like they did in mid-2013. At that time, residents could install a soil-moisture sensor device and be refunded for it through the program. The Water Management District has expressed a reluctance to relaunch the program because only about 250 sensors were installed compared with the 400 available, Ayers said. CEVA now is collecting a list of names of people interested in such a program so it can provide it to the Water Management District for consideration once interest is significant enough to restart that conversation. A longterm goal could be having a community-wide soil moisture sensor installation. CDD 2 Supervisor Donald Avoloi, who serves on the irrigation committee, said he has been working on with vendors to get a group rate on the soil moisture sensors from about $370 per system to as little as $200. Across nearly 2,800 homes, however, “It’s a big number,”— probably about $750,000— if the district were to cover those costs, Avolio said.